Here's a great little technique that was demo'd at the recent SU convention to create "faux icicles". 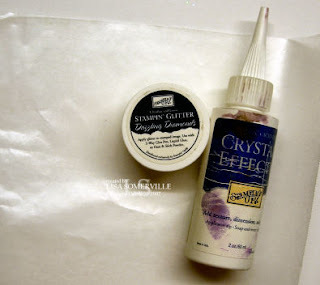 Add some Dazzling Diamonds Glitter to your wet crystal effects. Let dry. 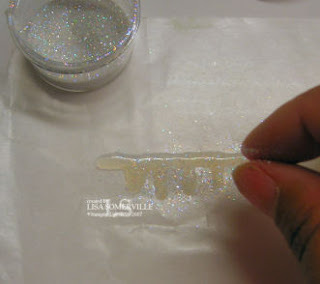 You can easily peel the "faux icicles" from the wax paper, then adhere to your project as desired, using snail or glue dots. That is So cute Lisa!!! What a clever idea! Wow, that is such a "cool" technique. Thanks for sharing. Great tutorial Lisa! I can't wait to try out this technique myself. Thanks for the tutorial! 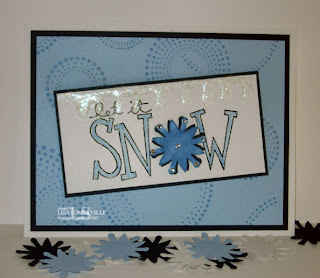 This will be great for my snowman cards I need to get made for a swap! Glad I'm not the only one whose stuff looks used like that :) very personalized. what an awesome idea! I'll have to try that sometime! Brilliant! Lauren Meader sent me over to take a peak. Sure clad I came! I am going to subscribe... Thanks for sharing that! Thank you that looks so good! Can I print it out somewhere?